Single stage paints include acrylic enamel, acrylic lacquer, and synthetic enamel. Single stage paint is paint (or resin) with pigment added to it. A single stage finish has the color and gloss in one coating. Single stage paints were used up until the 1980s when two-stage paints were introduced. When detailing single stage paint, paint transfer is common onto the pad or applicator since you’re polishing the pigment layer directly. Color transfer is a good indicator that your vehicle has a single stage finish. Single stage finishes tend to oxidize and fade over time, but you can achieve a dramatic makeover with a compound and a polisher. Clear coat finishes, or two stage finishes, include a separate pigment layer and clear layer. Clear coat finishes became popular because they retain their glossy look well. However, clear coat finishes do require wax and occasional polishing to keep them looking their best! Clear coats can oxidize just like single stage finishes, so regular paint protection is key. Unlike single stage paint, there’s no color transfer onto the applicator when detailing clear coat paint because you’re not detailing the color coat directly. If you see no color transfer, it’s likely that your vehicle is clear-coated. Clear coat finishes are on 95% of all vehicles being built today. 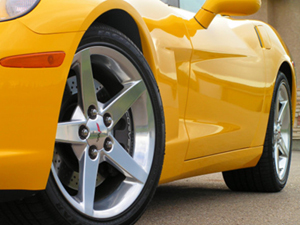 The vast majority of car care products developed today are suitable for clear coat finishes!? These same products can be used on single stage finishes, too. But, if a product says it’s only for single stage paint, stay away from a clear coat finish! Regardless of whether your vehicle has single stage or clear coat paint, ALWAYS maintain a coating of wax or paint sealant to preserve its beauty and value. 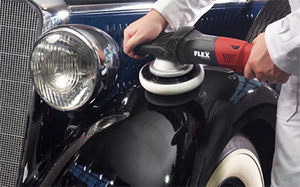 The FLEX XC 3401 VRG is an orbital polisher with forced rotation. What is forced rotation? Let’s compare it to a polisher without forced rotation, like the Porter Cable 7424XP. A Porter Cable 7424XP and the FLEX XC 3401 VRG are both described as orbital polishers, but there’s a noticable difference between these two machines. Both machines are constructed so that the pad rotates and orbits around the central spindle, but the FLEX features forced rotation. To understand forced rotation, it’s helpful to think of a bicycle. The back wheel of a bicycle is connected to the chain and sprocket and it’s driven by the pedals. There’s a mechanism forcing the rotation of the back wheel. This is like the pad’s rotation on the FLEX XC 3401 Orbital Polisher. The front wheel of the bicycle is just along for the ride. It rotates when the bike is in motion but there’s no mechanism driving it. That describes the pad rotation on the Porter Cable 7424XP it rotates freely as it orbits because of a free spinning bearing assembly. In practice, the forced rotation of the FLEX XC 3401 VRG and the free rotation of the Porter Cable 7424XP feel quite different. The FLEX pad completes full rotations and has a lot of power behind it to force that rotation. The FLEX XC 3401 VRG, even though it?s still an orbital machine, can remove a lot of imperfections. The Porter Cable?s motion is often described as jiggling, but it still achieves the dual action?that is, orbiting and rotating ? that will keep you from burning the paint. The Porter Cable 7424XP is great for minor defect removal, waxing, and general polishing. Learn more about our entire selection of orbital polishers at Autogeek.net. It’s already October. Before you know it, you’ll be scraping ice off the windshield. Get prepared now before the snow and ice set in, so you won’t be left out in the cold. It’s a little early for frost but you don’t want to be caught by surprise. Choose from Innovation Factory‘s unique snow and ice tools: the MINI IceDozer Ice Scraper, the IceDozer Plus Ergonomic Ice Scraper, and the SnowMover Personal Snowplow. 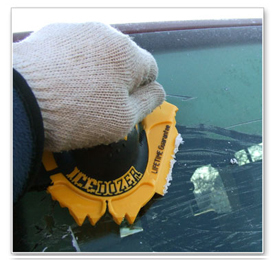 Ice scraping is easier when you use 1Z Einszett De-Icer Spray. It penetrates snow, ice, and frost so it can be easily scraped away. Clean your windshield and prevent re-icing with 1Z Einszett Anti-Frost Washer Fluid. It works down to -20F! Washing your vehicle is a challenge this time of year but Autogeek has some options to make it easier. 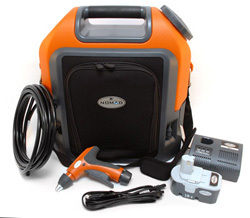 The Nomad 18 Volt Portable Power Cleaner is a cordless, rechargable car wash – minus the bucket and hose. The Nomad holds 3.5 gallons of water and has a high pressure sprayer. Rinse off road salt and mud any time, anywhere. Another way to wash is DP Rinseless Wash & Gloss, a rinse-free car wash concentrate. No water hose is needed! Wash your vehicle inside the garage using just two gallons of water. What stands up to road salt, moisture, snow, and grime? Wolfgang Deep Gloss Paint Sealant 3.0 does with its anti-static polymer formula. One coat lasts up to 5 months. Klasse All-In-One and High Gloss Sealant Glaze are a popular and extremely durable combination for winter paint protection. The tough acrylic coating lasts and lasts. Specifically in the Fall, car covers are a great way to keep falling leaves and debris off your paint. Select a custom Covercraft Car Cover to suit your protection needs. Minimize the amount of road salt and debris hitting the paint with WeatherTech No-Drill Mud Flaps. No drilling is requiped to install these sharp, custom-fitting mud flaps. WeatherTech Floorliners offer durable, full coverage protection for your vehicle’s carpet. These mats hold moisture, like snow and mud, and cover more area than traditional floor mats. If you travel during the winter, you must have a Battery Tender battery charger! A Battery Tender battery charger keeps your car battery fresh over long periods of inactivity, saving you the cost of battery replacement. The Battery Tender Plus is our most popular model and it’s also available in pink to benefit breast cancer research. Visit out Winter Car Care section for more great cold weather products. Rain! How to keep your windshield clear in wet weather. It’s Fall at last! For many of you that means more rain showers. With daylight savings coming up, you may be driving to and from work in the dark. Many more chilly wet mornings are coming. You can’t change the weather but you can change how you prepare your vehicle for it. Autogeek.net has many options to keep your windshield clean and clear, even in inclement weather. We highly recommend the Diamondite Glass Cleaning System Kit. You know how your windshield wipers skip over the glass and don’t really move much water? This kit solves that problem. Skipping or chattering wiper blades are caused by a dirty windshield. Dirt can become lodged in the glass, leaving the surface bumpy and gritty. An oily coating of exhaust film on the glass mixes with the rain to create a blurry mess on the windshield. The? Diamondite Glass Cleaning System Kit contains a glass cleaner to remove the oily film plus Spray Clay, a foam detailing clay, that removes the dirt that’s stuck in the glass. Lastly, Diamondite Shield creates a slick coating over the glass that allows water to bead and roll away. Your wipers glide over this coating and actually move the water. It’s like a new set of wipers! Try the Diamondite Glass Cleaning System Kit and the next time it rains, you’ll be so glad you used it. Another outstanding glass sealant is Aquapel Glass Treatment & Rain Repellant. The sealant is packaged in a single use applicator. One application lasts up to 6 months. You can find this service at detail shops but now you can get it at Autogeek.net for a very small price. Aquapel creates a hydrophobic coating that repels water so it beads up and rolls away. The wipers just help it on its way. You’ll be able to see through your windshield in the rain, even in the dark. Aquapel reduces the glare from car lights and streetlights. The best news is that one application of Aquapel will last you through the entire rainy season! This time of year, you find yourself using the heater because it’s colder outside, but then the interior windshield fogs up…then you’re trying to adjust the defrost. You need Glass Science Fog Clear. Fog Clear is a coating you apply to the interior windshield and windows. It dries clear. The coating absorbs moisture to eliminate condensation instantly. No more foggy windows. One last tip: take care of your windshield wipers. People often don’t think about wipers until they’re worn out. You usually discover that during the season’s first big rain storm! Like the rest of your car, a little preventative maintenance will ensure your wipers function when you need them. Use 303 Wiper Treatment Wipes to recondition rubber wiper blades so they glide over the glass. Snow and ice will not stick to treated blades, so this is a product you will want to use all winter. With a few inexpensive and easy-to-use glass care products, you’ll be able to maneuver this Fall weather safely. See more glass care products for all seasons at Autogeek.net. With record high temperatures on the East Coast of the U.S., it seems like a great time to offer some suggestions for heat-resistant waxes and sealants. Intense heat is one of the factors that can affect the longevity of wax. All waxes have a melting point. Carnauba’s melting point is the highest of any natural wax but, for long-term staying power, you can’t beat a polymer paint sealant. Collinite Insulator Wax #845 is a terrific wax that is literally made to withstand high temperatures. It was developed to insulate electric components but has proven to be an outstanding car wax both for its shine and protection. DP Poli-Coat Paint Sealant is an entirely synthetic, high bonding sealant with great gloss and durability. Released earlier this year, DP Poli-Coat Paint Sealant has a built-in bonding agent that gives it the staying power that is so important in the summer heat. Klasse High Gloss Sealant Glaze is, of course, a tried-and-true winner in the longevity department, no matter what the weather. Made with acrylic, Klasse forms a tough, protective coating that will easily last through summer, fall, and into winter. Wolfgang Deep Gloss Paint Sealant 3.0 is another long-lasting, high gloss paint sealant that will keep your vehicle protected all summer long. It was developed using German Super Polymers for maximum shine and maximum protection. This doesn’t mean you have to put the carnauba wax on the shelf for the summer. Apply a layer of carnauba wax over the paint sealant to get an eye-popping shine. For more excellent paint sealants, visit our paint sealant page at Autogeek.net! Which comes first: the wax or the paint sealant? This isn’t one of those philosophical questions with no real answer like, “Which came first: the chicken or the egg?” There is a definitive answer to whether the paint sealant or wax comes first. The answer is, the paint sealant always comes first. The reason is that car waxes almost always contain some kind of oily, slippery-feeling additive. It’s necessary to make the wax pliable and easier to use. (Natural carnauba wax is rock hard!) If you were to apply wax first and then a paint sealant on top, these oils would inhibit the paint sealant’s ability to bond to the paint. This method is likely to result in a cloudy, streaky finish. On the other hand, a paint sealant is usually free of such oils. Once the sealant cures to the finish – which can take anywhere from an hour to 12 hours, depending on the specific product – a wax can be applied top without any streaking or clouding issues. There are, of course, exceptions. The makers of Rejex specifically state that a wax will not bond well if applied on top of RejeX. However, there are countless paint sealants that behave just fine as base coats: Wolfgang Deep Gloss Paint Sealant 3.0, Klasse All In One or High Gloss Sealant Glaze, Griot’s Garage Paint Sealant, Menzerna Power Lock, and many more. One more exception to the rule: you cannot apply cleaner waxes on top of a paint sealant. The cleaners will take the paint sealant off. To rephrase the rule: When layering, always apply the paint sealant first, followed by a non-cleaning wax. If the idea of polishing glass makes you cringe, we’re here to tell you it can be done safely. And you can do it! A glass polish works a lot like a car polish. It contains abrasives that level imperfections, leaving the surface smooth and, in the case of glass, perfectly clear. It’s important to know what a glass polish can and can’t do. It CAN remove water spots, mineral deposits, etching caused by bugs and bird droppings, and very light scratches. A glass polish CANNOT remove chips or cracks. If your windshield is cracked or chipped, consult a windshield replacement technician. If it has spots and scratches, we have a polish for that! 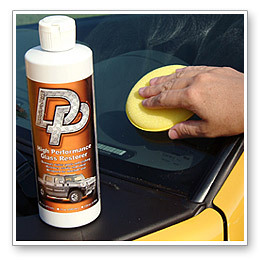 A quality glass polish like DP High Performance Glass Restorer will remove water spots and cloudiness to restore perfect clarity to your windows. You can apply it by hand or with a polisher, but set your machine on a low speed (1000-1200 RPM on a rotary or 5-6 on a dual action) and use a polishing pad. Do not apply pressure; the pad will do the work for you. When the polish starts to dry, stop polishing and buff the residue away with a microfiber towel. Another option is Diamondite Spray Clay. This is a clay foam that removes embedded contaminants from glass, as well as mineral deposits, using an included sponge. Spray Clay is part of the Diamondite Glass Cleaning System, which also includes Diamondite Glass Cleaner and Diamondite Shield. Spray Clay will not remove etching, but it will correct spots that are still on the surface of the glass. If your vehicle’s glass has mild to moderate scratches and mineral etchings, you may need the Diamondite Glass Repair System. This kit is specifically designed to be applied with a drill or rotary polisher. The included polishes and glass polishing discs remove more pronounced glass blemishes than DP High Performance Glass Restorer, yet the kit is still user-friendly for anyone who’s comfortable using a drill or rotary polisher. After polishing, your windshield and windows are naked. This is the perfect time to apply a glass sealant. The glass is already slick and crystal clear. A glass sealant will help keep it that way. Windshield wipers will last longer if they’re gliding across a slick, clean windshield. Water beads up and rolls away to improve your visibility when driving in the rain. Diamondite Shield will keep your glass clean and provide some protection against future water spots. Aquapel Glass Treatment & Rain Repellent is another great option that lasts up to six months. Both products keep auto glass cleaner, clearer, and smoother. Click here to see all Autogeek’s glass care solutions. One of the biggest challenges in car care is getting streak-free glass. But it is possible! With the right towel, glass cleaner, and method, you can eliminate streaks and enjoy virtually invisible auto glass. Not all glass cleaners are made equal. A household glass cleaner that works great on bathroom mirrors may not do the same job on your windshield. Here’s why: your windshield comes into contact with things your bathroom mirror has never had to contend with, like car exhaust and bird droppings. An ordinary glass cleaner doesn’t always cut it in the detailing world. Plus, household glass cleaners are usually full of ammonia. Ammonia is a great grease-cutter, but it strips factory window tint. 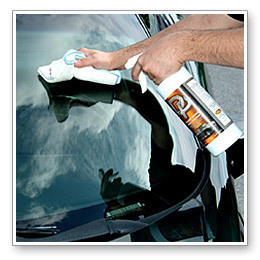 Save yourself the expense of replacing window tint by using a non-ammoniated, tint-safe glass cleaner. It will state tint-safe or ammonia-free right on the label because manufacturers know it’s important. If you need another reason to avoid ammoniated glass cleaners, ammonia dries out plastic, vinyl, leather, and rubber. Overspray inside your car is bad news! What should you use? There are a lot of quality auto glass cleaners that are free of ammonia. Stoner Invisible Glass, DP Krystal Vision Glass Cleaner, and Diamondite Perfect Vision Glass Cleaner are just a few. To get the best results, use a Cobra Waffle Weave Microfiber Glass Towel. The waffle weave structure gives the towel more surface area and a greater capacity for moisture. Plus, it’s extremely soft. Technique is important. Fold the Cobra Waffle Weave Microfiber Glass Towel and wipe in long strokes up and down the glass. Then flip the towel and wipe side to side, again in long strokes. Wipe until the glass is dry. Do the same on the interior glass. These long strokes will eliminate streaks from all angles. If necessary, use a second dry towel to buff the glass. The Glass Master Pro-Glass and Surface Cleaner can help you clean those odd angles of your interior windshield and back window. It has a pivoting, angled head and a long arm so you can clean interior glass easily. Washable microfiber bonnets on the Glass Master Pro leave the glass streak-free. ?Click here to shop Autogeek’s entire selection of glass cleaners and accessories. Donate to Operation Comfort and You Could Win! Since May 13, Autogeek has been taking donations for Operation Comfort. With Memorial Day coming up, we want to strengthen our effort to help this important organization. From Friday, May 28 to Monday, May 31, everyone that donates $10 each day will be entered to win a daily prize! Every day, all the $10 donors that day will be in the raffle for one prize. One winner will be chosen every day. Prizes are valued between $300-$350! Help out a great cause and enter to win a great prize! If you would like to help Operation Comfort, you can donate at Autogeek.net here or at checkout. Your contribution will be added to your order for your convenience. In recognition of Memorial Day, Autogeek.net has made a donation of $1000 to Operation Comfort, a nonprofit organization that offers support services to wounded veterans of the military operations in Iran and Afghanistan. But that’s just the beginning. We’ve asked all our vendors to contribute whatever they can to Operation Comfort. Operation Comfort reached out to the automotive community in 2006 with the launch of their Automotivation program, which teaches wounded veterans car restoration and refinishing. Their call was answered with donations of equipment and tools from a few generous vendors. We want to continue to answer that call to meet the needs of our wounded veterans. So far, we have received commitments or money and products to help Operation Comfort from Lake Country, P21S, Cyclo, Black WOW, Metro Vac, Optimum, Grit Guard, and Danny Braums, ESQ. We would like to thank these vendors for their generosity. 100% of the donated money will be presented to Operation Comfort next week. Learn more about Operation Comfort’s programs at OperationComfort.org. Thank you to everyone who has contributed to Operation Comfort so far. Your contributions allow Operation Comfort to continue providing wounded veterans with the support they need. Here in Florida and across most of the Southeast, love bugs are the primary culprit. Love bugs in particular have very fatty bodies, which produce a lot of enzymes. Plus, their sheer number and affinity for busy roads make them unavoidable. And, since they are love bugs, they hit your vehicle two at a time. 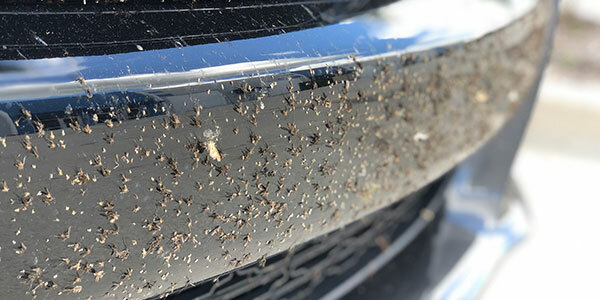 Besides bugs, your vehicle regularly encounters tar, tree sap, and bird droppings. All of these things are detrimental to the paint and should be removed ASAP (no pun intended!). You have many options for bug and tar removal. Visit Autogeek.net’s “How to Remove Bugs and Tar” tutorial for step by step instructions and product recommendations.